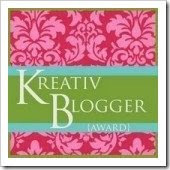 What a lovely surprise - I have been awarded the Kreativ Blogger Award! Thanks to my friend Cathy, from Celtic Cat Photos, for the wonderful award. I am honored and blessed! List 7 things that you love and then pass the award on to 7 people...tagging them and letting them know they won! You can copy the picture of the award and put it on your sidebar letting the whole wide world know you are KReATIV! 2 - Reading on the beach on a hot summer day. 3 - Solving a puzzle - whether a work issue, how to make something work in a knitting project, or a Sudoku. 4 - Reading fictional mystery books - refer to 2 and 3 above! I started to add some blogs here, but just can't do it. I know there are many who really hate this kind of thing. So, I ask you to please tag yourselves. If you see this and want to do it, I hope you will, and then come back here and let us know. Because of your great attitude you have been awarded the Lemonade Award!